Sometimes I get frustrated at meetings. As an in-house fundraiser sitting down with the rest of the managers, or as a consultant sitting down with the Board of a charity, I sometimes feel like I’m on a different planet. And I know why…because usually I’m the only fundraiser in the room. Very often, as a fundraiser, you’re dealing with front-line staff: therapists, aid workers, doctors, horse whisperers. And while they generally share the same long-term goals as you, more often then not they don’t understand your strategy or vehemently disagree with it. Being a fundraiser can be a lonely role. It can feel like the Board and staff underestimate you. It can feel like the media are against you. And everyone else overlooks you. 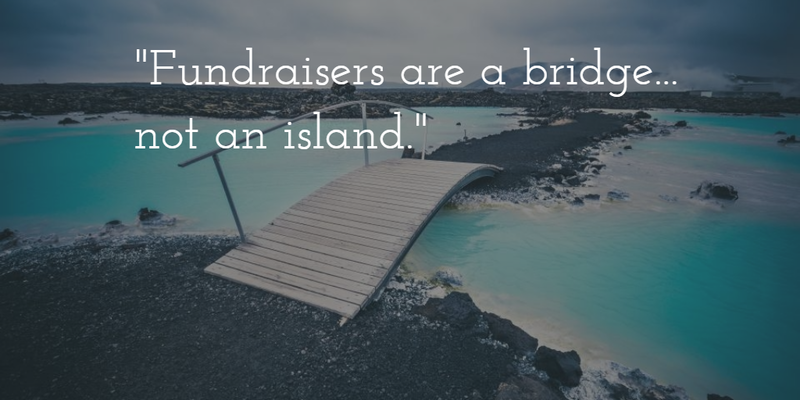 Fundraisers are a bridge…not an island. You are the bridge between donors and beneficiaries and staff and the Board. It’s you that unleashes your charity’s stories of hope on to the public. And it’s you that captures the messages of support that come back in. You’re isolated in the way a teacher is isolated. And what an honour to know that you – as a fundraiser – are a teacher. You teach your Board how to cultivate and steward. You teach co-workers how to sell. And you teach the world about the good work that happens behind closed doors. Being a fundraiser is an incredible job. And how special it is to look around and realise you’re the only one in the room. Thanks a lot, your words are coming exactly at the right time in my situation. I am a French “lonely” fundraiser struggling with what you are speaking about: underestimate, misunderstanding, etc. etc. This is even more disturbing as I am quite new in the job and I often feel like I am bad fundraiser, or like I am child who knows nothing about the job. I am waisting a lot of energy thinking about those things, and trying to convince my colleagues that my strategy is right. But your words are really good to read, kind of a therapy 🙂 Thanks a lot et best wishes for the coming year! So lovely to hear from you, and always encouraging to see that we’re not the only ones in a situation. Thank you so, so much for these wise words. A must-read this AM, and every day.